The minor-league season doesn’t kick off until April 5. When it does, the Cubs are going to have four full-season teams in action, and come June, an additional five short-season teams. That amounts to some 300+ prospects. It’s going to be exciting to try and keep up with all of them. Usually, one affiliate stands out every year as the one to watch, the one that grabs everyone’s attention, and the one that has the most advanced talent. It usually comes down to where the elite prospects are. It used to be wherever Bryant, Baez, Schwarber, or Eloy were playing, that’s where the attention was given. The problem now is that the Cubs are missing that elite talent. Still, there are several prospects worth watching who could help the big-league club in the near future. The question is, which affiliate will be the one to watch? The Cubs will have several players who can come up and help the big league ball club at some point this year in minor roles. Victor Caratini will probably be the first call up and Ryan Court, Mike Freeman, and David Bote have put themselves in that conversation in the spring. There are, however, only a few arms who could step in at the major-league level and be ready. Jen-Ho Tseng, Alec Mills, and Dillon Maples lead that list. While there is not technically not an elite prospect, Iowa does have players who can fill a spot for a while. The Smokies are going to have several players this spring who won a first half title last year at Myrtle Beach. The problem is they did not do well the second half. Still, the Smokies might have the most interesting older arms to watch in Trevor Clifton, Oscar de la Cruz, Thomas Hatch, and Adbert Alzolay, at least to begin the year. Outfielder Eddy Martinez looked to be figuring things out in the second half last year as he hit over .270 with seven home runs down the stretch for the Pelicans. Shortstop Zack Short could also entertain the masses as well. That pitching staff, along with Duncan Robinson and Michael Rucker, make an intriguing case as the team to watch. The Pelican are going to be showcasing a few interesting bats in outfielders DJ Wilson, Kevonte Mitchell, and Luis Ayala. All three had somewhat impressive seasons, at times, in 2017. Mitchell, who is closing in on 240 pounds of solid muscle, could be the breakout hitting prospect of the year in 2018. However, 2017 draft pick Austin Upshaw had a great debut at South Bend and might be the one player to watch hit on a nightly basis. Add in top prospects Aramis Ademan and the young Pelicans might win the debate when it comes to hitting. As for pitching, lefties Jose Paulino, Manny Rondon, and Bryan Hudson could shine for the Pelicans as the wind tends to blow in off the ocean most days. With several 2017 draft picks in tow and a top pitching prospect in Jose Albertos, South Bend might have the most impressive collection of arms in the starting rotation from 1 to 8. To go along with Albertos, first-round picks Alex Lange and Brendon Little will be joined by Cory Abbott, Javier Assad, Keegan Thompson, and more than likely, Jesus Camargo and/or Bailey Clark. It should be an electric night every evening throughout the Great Lakes in April and May. As for position players, the young Cubs will have plenty of bats looking to prove themselves in Miguel Amaya, Austin Filiere, Jared Young, Brandon Hughes, and Jhonny Bethencourt. It’s hard to pick just one affiliate to watch. While pitching seems to be the focus of the organization, come June that will change when the short-season teams play. When it comes right down to it, the team that I’m going to be focused in the middle of summer will be Eugene, as they will have an outfield of Nelson Velasquez, Jonathan Sierra, and Fernando Kelli. They might be the most versatile mix of power and speed anywhere in the Cubs’ system. 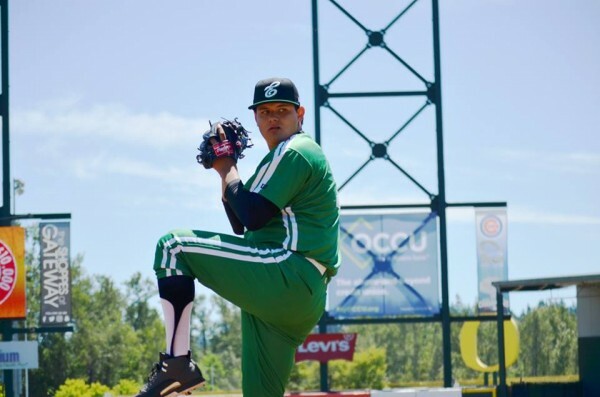 Add in SS Luis Vasquez, 2B Delvin Zinn, and 5 draft picks from the first 100 in this summer’s MLB Draft, there are going to be some serious athletes playing in Oregon in the great Northwest on a nightly basis. And I didn’t even bring up Danis Correa, my breakout pitcher of the year, who throws in the upper 90s and is only 18. Yikes! However, June is a long way away. Until then, my focus will be on the plethora of pitching at South Bend. The main reason for my decision is that most of the rotation had small pitch counts last year because of injuries in 2016 or they were just drafted after already having played a full season of collegiate ball. Now, with those limits pushed to the side, every arm is free to be let loose. I can only imagine what Albertos’ change will do along with the curves of Lange and Little, the slider of Abbott, and the precision of Thompson. Add in Camargo’s change, Assad’s fastball, and a reborn Clark (who has been in the mid 90s in camp), these pitchers are going to be worth the price of admission every night. The problem is that only six of them can start. Still, watching them be piggyback starters will be just as good.